Just seeing Raymond Thomas makes me feel good, and his art makes me feel even better. I was an admirer of his work long before he launched his fine-art career. Our paths first crossed years ago when John H. Johnson, the legendary founder of Johnson Publishing Co. and Ebony Magazine, hired Raymond right out of the Art Institute of Chicago and I began working with the talented young man as he designed layouts for Ebony and worked his way up through the company. As he matured professionally, his personal art also blossomed and matured. When Raymond T (which is what I call him) launched his first Son of Man collection some years ago, I was enthralled by the depth and breadth of his work and the thought process that led to them. I purchased a piece from that collection, a collage titled “Joseph and Mary Escape the Ghetto,” and it proudly commands a wall in my living room. From the moment I became familiar with Romare Bearden’s work, I have favored collages, and I am delighted to have what I consider to be a piece that will stand the test of time as has those created by Bearden. 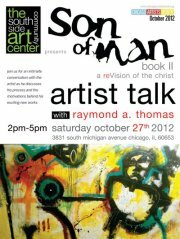 I visited the South Side Community Art Center at 3831 South Michigan Avenue, where Raymond was hosting an “artist talk” featuring his new collection, Son of Man Book II: A Revision of the Christ, a new series of collage and mixed media works. In this second of a three-part contemporary re-telling of the life of Christ, Raymond T creates powerful works that dare to strip away dogma and challenge perceptions of the image and personage of Jesus Christ. 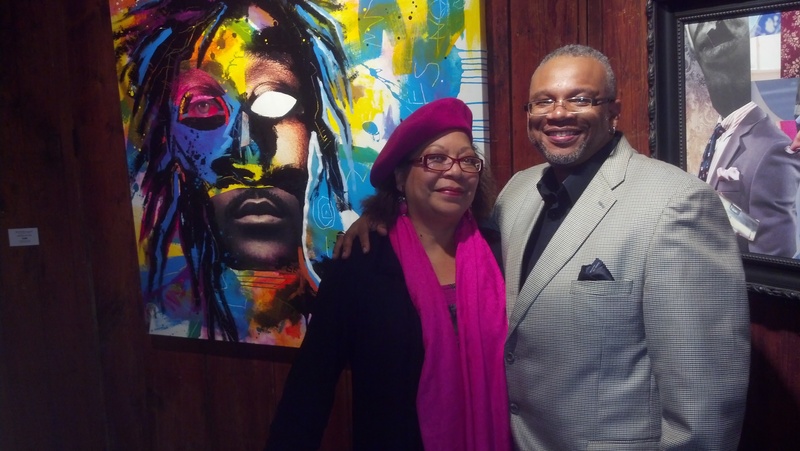 A graduate of the School of the Art Institute of Chicago, Thomas, who serves on the board of the South Side Community Art Center, is also an international award-winning filmmaker and former longtime art director for Ebony Magazine.